Two of the most influential people in the music world have come to campus, but there is no entourage, no buzz, no publicity. Perry and Paul Tollett are far too humble for any of that — but make no mistake, they are Players. 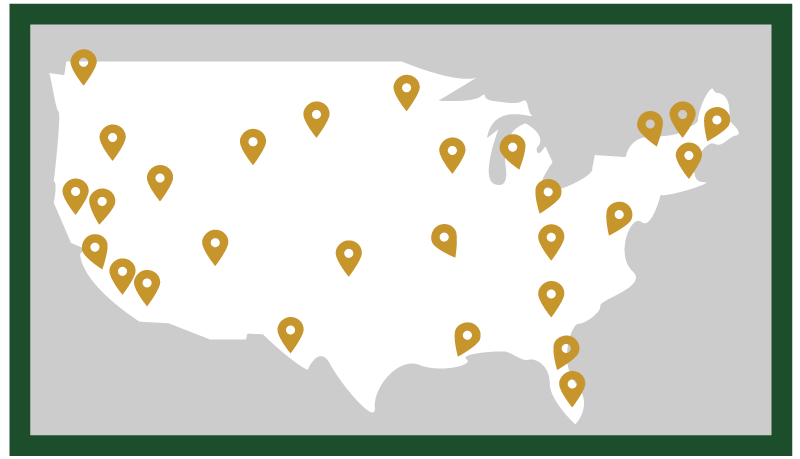 Coachella … Stagecoach … The Glass House … The Fox Theater. 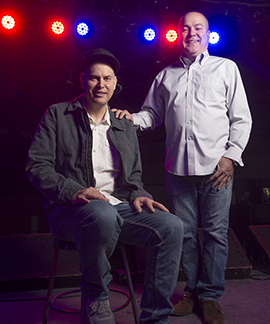 The Tollett brothers are at the epicenter of the live music performance world, with a network of connections that range from Paul McCartney to Willie Nelson to Madonna and Prince, as well as virtually every top performer in today’s pop world. They can jump-start fresh careers or breathe new life into older ones. Every January, legions of music fans await the announcement of the Coachella Valley Music and Arts Festival’s lengthy list of performers and scramble to purchase the 200,000 available tickets. This year, both weekends in April sold out in three hours. Afterward, millions follow and discuss the lineup. Coachella’s country music equivalent, Stagecoach, is a huge draw as well with an equally passionate fan base. In Pomona’s arts district, the Glass House and the Fox Theater have become the Inland Empire’s counterpart to the Hollywood scene, serving as incubators for future stars and popular venues for established musicians. Perry and Paul Tollett have arrived at a conference room in the music department on a quiet winter morning to reflect on their careers and their passions. This is a homecoming, because this is where it all began more than three decades ago. They are also here to support the All-Steinway School Initiative, an ambitious campaign to acquire 29 Steinway pianos — one for every practice room as well as the recital hall. It is one way they want to give back to a place that was instrumental in their lives. The Tollett brothers almost didn’t come to Cal Poly Pomona. Perry, who is four years older, had no intention of going to college. He was running a successful upholstery business out of his parents’ garage in West Covina when a customer persuaded him to enroll. Not long afterward, a band from Pomona College calling itself the Targets posted fliers in the music building saying it was looking for a drummer. The Targets faded to little more than a footnote in the local music scene, but in retrospect it proved to be the Tollett brothers’ first Big Break. Perry and Paul play off each other, sometimes finishing the other’s sentences or adding details to anecdotes. It is clear that, to this day, their collaboration is grounded in friendship and respect. It allows them to constantly push each other. Paul followed Perry into chemical engineering at Cal Poly Pomona. It allowed them to take classes together and hang out during breaks at the Bronco Student Center, where they would talk music with friends. One was Kevin Lyman, who would go on to found the Warped Tour, a music and extreme sports festival. But back then, success was a far-off notion. When they weren’t studying or hanging out, they were promoting concerts at local pizza parlors or Moose lodges, the minor leagues of the music world. In those pre-Internet days, they relied heavily on fliers and posters to spread the word. “They had so much ink, you’d get a little lightheaded in the car,” Paul says. The brothers also became friends with the people who scheduled concerts on campus. That blend of experience and audacity led them to their second Big Break. The promoter, Gary Tovar of Goldenvoice, and the two brothers plugged the concert at the Pomona Valley Auditorium. “… and it was magical from the beginning,” Paul adds. Perry soon graduated and got a job at a pharmaceutical manufacturing plant, but not for long. Meanwhile, Paul continued to take classes and work for Tovar. During his senior year, Goldenvoice signed a deal giving it exclusive promoting rights at the Hollywood Palladium. He decided to work full time as a promoter. Paul and a business partner bought the company from Tovar in 1991. Although they were running Goldenvoice with little money, they made it work. Five years later, the Tollett brothers decided to open a music venue in Pomona. “When we were kids, all the cool shows were in Hollywood or Orange County. We felt we got shortchanged, so we wanted to have a club,” Paul says. “The fabric of the old downtown was better than the strip mall fabric that we grew up around,” Perry adds. That first venue was The Glass House. Later, Perry teamed up with local businessmen Ed and Jerry Tessier to purchase and renovate the Fox Theater to stage larger concerts. Paul and Goldenvoice then hit on the idea of a music festival in Coachella. The first Coachella festival in 1999 featured Rage Against the Machine, Tool, Beck and Morrissey, artists the brothers knew from promoting them. Although Goldenvoice lost money, Coachella drew a huge crowd and good buzz. Entertainment giant AEG took notice and bought the company, giving Goldenvoice the financial backing to take risks and make Coachella an annual pilgrimage for concert-goers. Stagecoach followed. Organizing two of music’s seminal concerts is a full-time occupation. While Paul is responsible for orchestrating the lineup — more than 100 acts per event — Perry provides his perspective on the artists, and he designs and builds the stages and fencing for the venues at his shop in Pomona. Goldenvoice employs a lot of students at Coachella, and the brothers say aspiring promoters can still learn the ropes as they did.